These days you can buy an app that will turn your phone screen into a romantic virtual fireplace, and an app that your cat can use to make paintings. That’s right: your cat. While there are unquestionably zillions of apps that are designed to make people more productive at work, there are an equal number of apps that can ruin productivity or be used deliberately to annoy people. Here are six annoying apps, and how IT people may dream about using them in the workplace. 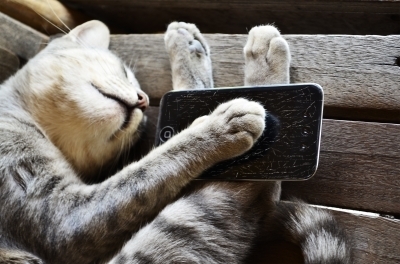 The more productive your cat, the more time he can devote to getting his beauty rest. This app is exactly what it says on the tin: a noise emitter. The description begins with this promising sentence: “Annoy your friends, family, or anyone else like never before.” You can choose a frequency from 200 Hz (low enough not to be too obnoxious) to 20,000 Hz (high enough that basically only dogs can hear it). Training a room full of restless co-workers who need to settle down so you can begin? You may not have mastered the ear-shattering two-fingered whistle, but with this app, you don’t have to. You promised to send your colleague a copy of the slides you used in a presentation on network security last week. They’re great slides and all, but if you really want to make them pop, why not add some glitter? Glitter has been scientifically proven to make any picture more attractive, engaging, and awe-inspiring, and Sparkle Draw lets you add all the glitter you want. Did you get a great phone snap of a massive tire fire on your way back from a conference? Add some glitter and you have yourself a work of art worthy of any classy living room. Mobile technology is double-edged. While it lets you stay entertained while you’re waiting at the dentist’s, it also lets people get in touch with you anytime, anywhere. Annoying Noises is there to help. Next time that junior coworker who wants your blessing before doing anything at all calls you as you step off the plane headed for a mind-numbing terminal crawl in Dallas, fire up Annoying Noises on your tablet. Cue up the jackhammer, blame it on “airport construction” and you have the perfect excuse to cut the call short. Do you work with someone who has boundary issues, yet thinks it’s unprofessional to bring his phone to big meetings? Invariably, this person has no qualms at all about grabbing your phone and playing with it rather than suffering in silence like everyone else. When you install Crack My Screen, it runs in the background and activates when the screen is tapped, making it appear as if your screen has been instantly ruined. You can even add the sound of glass breaking, to ensure Mr. Sticky Fingers learns his lesson. Is there someone at work who thinks it’s OK to walk up behind you and watch what you’re doing for no apparent reason? Do you need an excuse to buy an iPad? Goggle Eyes is all the justification you need. Simply launch Goggle Eyes, park your iPad within the perpetrator’s line of site, and wait. The Goggle Eyes monkey is like those paintings in movies about haunted houses where the eyes follow you no matter where you are. After a few minutes of the monkey’s unbroken gaze, your office buttinski will be uncomfortable enough to go bother someone else, and isn’t that the key to a good work environment? There’s no shortage of silly apps out there, but if you work the IT service desk you may find yourself helping people whose work apps have crashed or who need new apps to accommodate their field work or business trip. With Samanage, IT asset management is far easier and more effective, letting you know where all company hardware and software assets are located and helping you account for every new application installed on employee devices.